I love the Church Jesus founded on His rock, St. Peter. I was baptized Catholic as an infant, was married in the Church, and in recent years have witnessed my grandchildren receive their First Communion. I love the sacraments and understand how precious and wonderful are the treasures of the Church. These treasures are not money or priceless art, but the Body and Blood of Jesus Christ. His living presence is among us to this day! The Eucharist is guarded by His Church, but also worshipped and adored. Along with His physical presence, the Church and its leadership are entrusted with keeping sacred the Words and Teachings of Jesus Christ. Jesus is the Truth and the Way. These are dark days. As the world blocks out the light of Jesus, darkness prevails. Many have fallen into this darkness, including some who were ordained into leadership roles of the Church. Humans are weak. Even St. Peter at the dawn of the Church denied Jesus Christ. It was a dark time, but the Holy Spirit gave courage, wisdom and guidance. A few men fed a handful of sheep with the Truth, which led to a world wide Church today. Being cautious of offending, has watered down the Truth of Jesus Christ. Holy Father, be the voice of clarity and truth in this precious Church. May the Holy Spirit always inspire you and give you courage to feed His lambs, tend His sheep, feed His sheep and Follow Him. My five-year-old grandson is star struck with super heroes. There are many of them: Ninja turtles, Power Rangers, Spiderman, and The Incredibles are a few I’ve heard about. That has me thinking – just what is a SUPER HERO? Ok, I get it that these characters are the good guys who defeat the bad. But, what are we teaching our kids about defeating the bad when it seems you have to have super human strength and be able to beat up or destroy with a wide grin on your face? Sadly, it seems to me that more and more, the lessons of Jesus Christ are being ignored and forgotten. Jesus is our ultimate SUPER HERO!! He defeated the ultimate bad guy – Satan!! Our Savior came into this world to preach Love and Forgiveness. He was pure Good and Love and how did mankind respond? Jesus was mocked, beaten, tortured, and murdered. Jesus could have stopped this madness. After all, He was God. Instead He offered Himself up for our sins and our salvation. 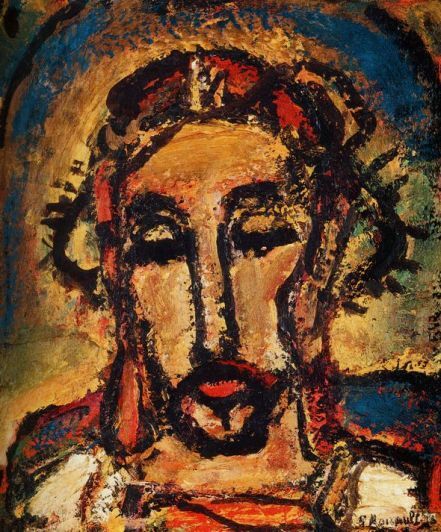 His sacrifice was a lesson in Redemptive Suffering and the power of Forgiveness. The Cross became the ultimate symbol of LOVE! Too often people are judgmental, selfish and proud. We look for the worst in others to make us feel better about ourselves. We choose to be divisive and disrespectful of all God’s children who are different than ourselves. The world has become a harsh and unloving world. The people who do choose to follow the teachings of Jesus Christ are mocked, beaten, tortured and murdered. These followers are the new Super Heroes. They are standing up for their beliefs and their God. Our Lords’ mother has been making trips to this earth regularly during the last few centuries. She has been warning about times like these. She always asks for prayer and sacrifice. She always asks that we change our hearts and follow her Son, Jesus. “Dear children, with motherly love I implore you, love one another. May there be in your hearts, as my Son desired from the very beginning, love for the Heavenly Father and for your neighbor in the first place – above everything of this world. My dear children, do you not recognize the signs of the times? Do you not recognize that all of this that is around you, all that is happening, is because there is no love? Comprehend that salvation is in true values. Accept the might of the Heavenly Father, love Him and honor Him. Walk in the footsteps of my Son. You, my children, my dear apostles, you are always gathering around me anew, because you are thirsty. You thirst for peace, love and happiness. Drink out of my hands. My hands are offering to you my Son, who is the spring of clear water. He will bring your faith back to life and purify your hearts, because my Son loves pure hearts and pure hearts love my Son. Only pure hearts are humble and have firm faith. I ask for such hearts of you, my children. My Son told me that I am the mother of the entire world. I ask of those of you who accept me as such to help me, with your life, prayer and sacrifice, for all of my children to accept me as a mother – so that I may lead them to the spring of the clear water. He has healed us with His Wounds. He has given us His Mother to help us follow His footsteps. Let’s teach our kids about the Greatest Super Hero – OUR LORD JESUS CHRIST! Monday morning I was watching the news and in a matter of minutes heard news reports about an earthquake, forest fires, sink holes, tornadoes and a hurricane! It was astounding to me how matter-of-fact these events seemed to me. As a child, I would have thought the world was coming to an end had I heard of all of these events in one day! With the world in a turmoil – Iraq, ISIS, Syria, Russia, Ukraine, Israel, Gaza,….and our own country’s troubles; it seems only natural that our Lord, through his creation of nature, would be warning us to take heed. A news program like Monday makes me pray and beg for God’s help in what seems to be a confused and crazy world. 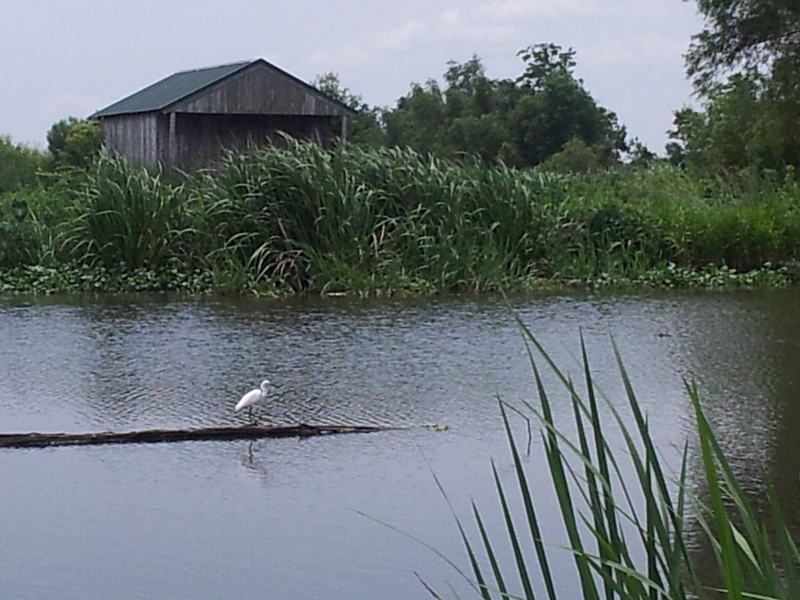 Living in Cajun country, I have seen my share of storms and hurricanes. My worse was hurricane Andrew in 1992. In the 2005 we had hurricanes Katrina and Rita. New Orleans took the brunt of Katrina. I work for a company based out of New Orleans. Our New Orleans employees were displaced and some became homeless as a result of this devastating hurricane. Rita hit closer to home and lower Iberia Parish had hundreds of homes flooded as the storm surge wreaked havoc on the coast. 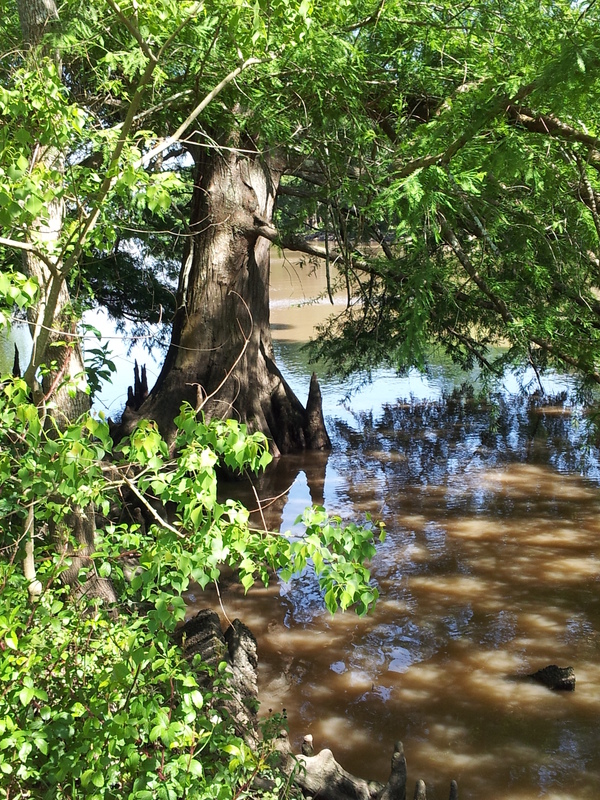 The normally calm bayous and shady oak trees became torrents of flood waters and falling masses of destruction. I was home for hurricane Andrew. It is a very scary feeling to know that you are at the mercy of mother nature. What can we do to combat these forces of nature? Well, our community and family decided after 2005 that it was time to pray. At all of our masses at Our Lady of Perpetual Help Church, we begin during hurricane season with a hurricane prayer. At all of our family rosaries on Tuesday nights, we end our rosary with a prayer for hurricane season during the months of June through November. Since 2005, we have not had a major hurricane hit our area. I am not saying it is solely because of these prayers – but I am saying that it might be! I cannot change the world. I cannot make evil go away. Sometimes things seem so out of control that I feel it is impossible to find a solution. It is at these times that I have to trust in God and know that He told us prayer is powerful. If we have the tiniest bit of faith we can move mountains. During these times of evil and meaningless deaths, I am asking you to join me in praying fervently for God’s intervention. Together we can weather the storms. With God’s help we can overcome them. Friday is my mother’s birthday. She is in her seventies and a retired nurse. Nursing is in her blood, heart, and soul. My mother left nursing to be a stay at home mom with her first born, which was me. Although she was not at a hospital or in a nurse’s uniform, she had plenty of opportunities over the next eighteen years with her four daughters to put her nursing experience into practice, until the day when she would return to the career she loved. I loved being sick! Upon being diagnosed with an ailment, we girls would be ordered by our very own “nurse” to put on our pajamas and go straight to bed. The pampering would begin. Our mother brought us soup and crackers on a bed tray. She took our temperature every hour and poured our baths for us. She brought us our medicine and changed our bed sheets. At the time I thought every sick child in the world received the same treatment I received from my mother. She never complained. She was patient, gentle, and kind. Whatever we asked for while sick; she was happy to accommodate. What a gift! As our nurse, she tended to our physical needs. As our mother, she tended to our souls. She made sure we attended mass every Sunday. We witnessed how important prayer, the rosary and Bible were to her daily life. She shared stories from the Bible about Jesus and our mother Mary as well as bearing witness to the Saints and their intercession for us. Once I was married with my own children, I realized the sacrifice my mother made to leave the job she loved and to care for us so tenderly when we were at our worst! I am so happy that she did return as a labor and delivery nurse when her children were all of school age. She made quite a difference in the lives of many patients and their little ones. Good mothers must make the best nurses! Nurses, however, do not make the best patients! We had a scare this past week when mom had to be admitted to the local hospital for tests on her heart. She had not been feeling well for a long time. It was a bit of a struggle to get her to admit she needed to be admitted to the hospital. Once a care-giver, always a care-giver. She is not comfortable with receiving care and being the patient. The Lord gave her plenty of warning signs and she finally listened. She now has been diagnosed and is receiving the correct treatment. Having been in the company of plenty of doctors over the years, my mother understands that the one True Great Physician and Healer is the Lord. Our God does use people and situations to have His Will known. We are all His creations and He has a plan for each of us. It is a blessing when we are given the insight into what our Lord has planned for us. We all have God-given gifts. My mother was given the gift of lovingly being able to take care of the sick. That was her calling and she obeyed. My earliest memories are of my mother daily making trips to her mother’s house where she would give her insulin and check on her health. I can always remember her caring for elderly neighbors and family members. She has taken the gift God gave her and given it to others. Even though she is now retired, she is always there for a sick friend or family member. Thank you for your loving care. You have been a great role model for your girls. We are all better mothers because of you! It must make you very proud that one of your daughters has followed in your footsteps and is following God’s call to also be a nurse – to help heal souls! Enjoy your birthday. Take it easy and rest. If you need some loving care, I’ve been taught by the best! I will be there, as will all your daughters. You’ve had fifty years of caring for your family – it’s time you were treated to some pampering! 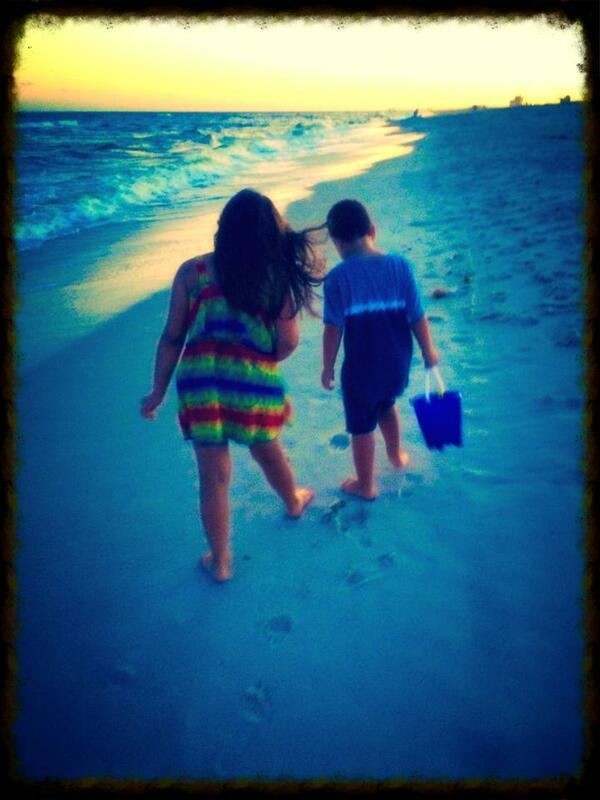 Recently my daughter and my two grandchildren took a beach vacation. Upon returning, my daughter shared a cute story with my husband and I that I would like to share with you. My daughter and her children frequented an arcade while on vacation. The arcade had a virtual reality roller coaster. It sat two people who are fully enclosed in the ride which rises, falls, and rotates around to give the extra added sensation of being on an actual roller coaster. My grandson noticed this ride on the first day and begged his mother to let him on it. But his mother felt that a four-year-old was just too young for the ride. This went on the entire trip. An arcade visit always ended up with the four-year-old begging his mom to let him ride the roller-coaster. On the last day of the trip my daughter noticed that her son did meet the height requirement for the roller coaster. She spoke to the attendant, who informed her that the ride had a slow, medium, and fast speed. She was told the slow speed was appropriate for her son’s age. So, with much trepidation, she let the four-year-old with his seven-year-old sister get on the virtual reality roller coaster. The two kids sat in the ride. The attendant explained to the older sister to pick the “slow” speed and advised her of the “emergency button” should there be a need to stop the ride. The attendant closed up the ride. My daughter watched as her no longer visible children rose up in the air in the machine. As the ride started up, the attendant looked at my daughter, smiled and said, “She picked the fast speed!”. Yes, my little angel of a granddaughter decided that she would give her little brother a ride he would remember! Their mother was helpless. She could only watch the machine rise, fall and rotate. Her stomach felt sick and her heart was pounding. What was happening in that thing? Near the end of the ride, the attendant once again looked at my daughter, smiled, and said, “They pressed the emergency button!” Finally, the ride came to an end. It lowered and the amused attendant opened the hatch. Once open my daughter saw her own daughter sitting, giggling and just tickled with herself! The little brother was in tears and wanted his mommy! I love this story. It holds so many of life’s lessons in that one story. Life is like a roller coaster – it has its ups and downs. Be careful for what you wish for..
For me that emergency button is my Lord. When things get too much to handle, I need to just relax, pray, and give it to the Lord. He is my Healer, my Strength and my Sanity! God never sends sorrow without joy, Nor the sun without the rain. He never gives us a cross too heavy that we can’t bear the pain. He is always present within our hearts, whispering encouragement to you and me. He lifts us up when we are down and listens to our humble pleas. Who else would have the patience to listen to our complaints, yet hold us close to His gentle heart and love us without restraint? There is always another river to cross and another mountain to climb. If we but put our trust in Him, we’ll be filled with His love sublime. His arms are always opened wide, waiting patiently to embrace troubled souls like you and me and to fill us with His grace. Tomorrow or another day soon we’ll be filled with happiness and bliss. It is Memorial Day. I have much respect for our fallen soldiers. My husband is a veteran; I know first hand the sacrifice and life-threatening situations our soldiers endure for our country and our freedom. This Memorial Day, I am also choosing to remember our fallen brothers and sisters who died defending their beliefs and Jesus Christ. It is so important to remember these sacrifices especially today when it seems as if so many in today’s culture wants us to forget the lessons taught by our Savior more than 2000 years ago. The battlefield has moved to our own state capitals, county court houses, and our own back yards. In the history of the United States of America, there have been many wars and battles. The Revolutionary War of 1775 saw 25,000 dead; Vietnam War, a total of 58,209 died. All together, over a million United States citizen have died protecting our freedoms, including our freedom to follow our own religious beliefs and morals. Since the time of Jesus Christ, there have been countless martyrs. Saints Stephen, Peter and Paul all died proclaiming the gospel. St. Joan of Arc was executed in 1431. More recently, Maximillian Kolbe died in 1941 and Oscar Romero in 1980. You may be thinking that all of these individuals were not killed in this great country that was founded on principles of freedom, and that is true. This country is slowly persecuting Christians by taking away their jobs and economic resources. Speak out candidly regarding matters of faith and you risk losing your job, friends, and respect. I will also argue that there are many more victims killed in this country today than ever in our country’s history. Remember the “Massacre of the Holy Innocents”, Matthew 2:16? Since 1973, Roe v. Wade, over 40 million innocent babies have been legally killed in abortions. That is 1100 times the number of fallen soldiers in the Vietnam War. Already this year, there are over 450,000 victims. Pro-abortion advocates have always stated that legalized abortion protects women. The truth is that in 1970 there were 119 deaths resulting from illegal abortions. Legalized abortions have not brought down that number, in fact it has increased. Abortion clinics have not been regulated and women have been injured, harmed, and many have died. Of course there is always a death in every abortion, as a creation of God is given a death sentence because they are an “inconvenience”. One of the readings at mass yesterday was Acts 8:14-18. “they sent to them Peter and John, who came down and prayed for them that they might receive the Holy Spirit, for it had not yet fallen on any of them, but they had only been baptized in the name of the Lord Jesus. 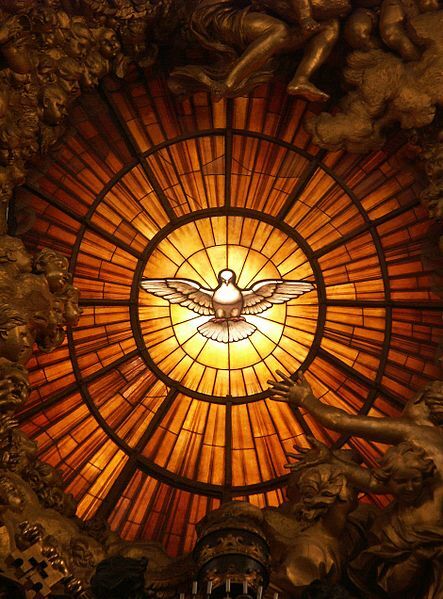 Then they laid their hands on them and they received the Holy Spirit.” This passage for Catholics is the Biblical foundation for the Sacrament of Confirmation. As infants, we are baptized into the Church, which is the mystical Body of Christ. As adults, we become confirmed, which gives us the special strength of the Holy Spirit. Once confirmed, we are to become true witnesses of Jesus Christ and are obliged to spread and defend the faith by our words and deeds. It is not easy to speak out in defense of our beliefs these days. Society wants to tell us our beliefs are old fashioned and meaningless. We must remember those who have gone before us and gave their lives so that we could be brought up in the faith. I encourage all of you to view the YouTube video clip of Jim Caviezel’s speech at the Rock Church. Not only did Jim play Jesus on the big screen; he is living a life in imitation of Christ and defending what is a true Christian. If all Christians spoke out in defense of our faith – this nation would see great changes. If all Christians voted according to candidates that will uphold our Christian values – this nation would see great changes. It starts at the home. Teach the faith to your children. Teach your children to stand up for their beliefs. Pray as a family. Pray and fast for the conversion of this nation and our world. Remember all the fallen soldiers who have died protecting our country and our freedoms. Remember the Christian Martyrs who have given their life in defense of Jesus Christ so that His teachings would remain. Remember the innocent victims of the legalized sin of abortion, both the mothers and the children. Remember your faith. Remember Jesus Christ. 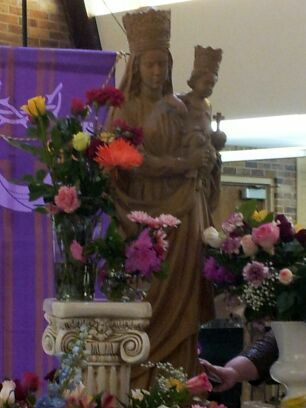 My daughter and I recently attended a Lenten retreat given by Immacule’e Ilibagiza in Thibodaux, Louisiana. Immacule’e is the author of Left to Tell, Our Lady of Kibeyo, and If We Had Only Listened. She is a survivor of the Rwanda genocide of 1994 and tells an amazing story about her journey of faith and forgiveness. If ever you have the opportunity to hear her speak, I encourage you to do so. It is a moving and very spiritual experience. Immacule’e shared something with us that was so unbelievable, I want to share it with everyone! It involves her book, Left to Tell and Hollywood. Once Left to Tell was released and became popular, Immacule’e said that she began to have people ask her if she would make a movie out of her story. She thought that would be impossible because her faith, the Bible and the rosary were so important to her survival; she did not feel that Hollywood would truthfully expose her faith in a movie. The more she traveled and met people, the more she heard them say that there should be a movie made of her story. One day after hearing this same request for a movie and after giving the same answer that Hollywood would not depict her spiritual journey, Immacule’e was given the name Steve McEveety. McEveety was the producer of “The Passion of the Christ”. This was a favorite movie of Immacule’e, but she had no clue how to reach McEveety and no idea about the workings of Hollywood. So, she did what she knew. She prayed the rosary. Immacule’e started a 54 day rosary novena. She asked her friends to pray the novena with her, and together they prayed for Mary’s intercession that if this movie was to be made, Immacule’e would meet Mr. Steve McEveety. She went on to say that Jim’s wife was a lovely woman and they were enjoying the visit when there was a knock at the front door. Who was at the front door? None other than Steve McEveety and his wife! She was in shock. She said she had to stay calm, but every part of her wanted to shout out, “Thank you Mother!”. The five of them sat around a kitchen table and they asked Immacule’e many questions about her ordeal in Rwanda. At one point, Steve’s wife nudged him and told him, “You need to make this movie.” He replied there was no way he could do this. Immacule’e said she said nothing, but inside she thought, “If our mother wants you to make this movie, you WILL make this movie!”. Returning home, still marveling at the coincidences that had occurred; Immacule’e received an email from Steve McEveety exactly on the last day of her 54 day novena. McEveety told Immacule’e that whatever it took, he WOULD make her movie! 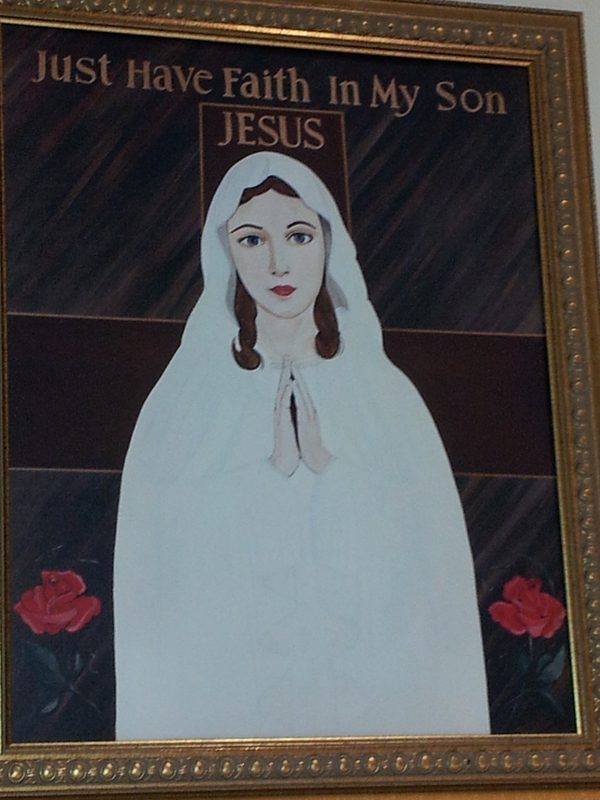 Immacule’e is living proof of our Lord’s love for us and His mother and the power of prayer! I cannot wait for this movie – ordained by our Lord – for all of us.